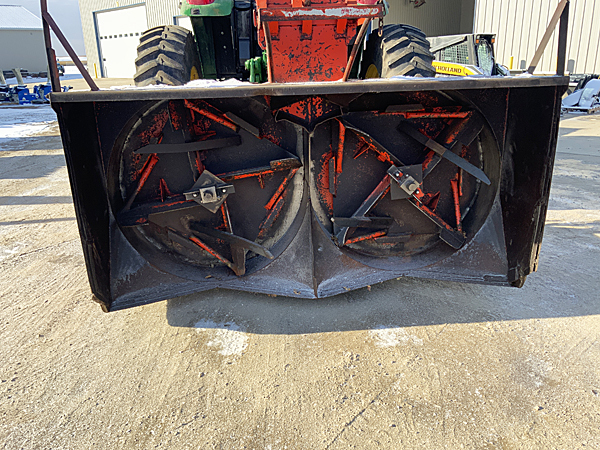 11' heavy duty push blade with newer cutting edge with mount kit. Was removed from John Deere 6120 4WD, 75 hp utility tractor. Direct mount to front of tractor (not SSL mount). Can be modified to fit any tractor. Excellent condition. Used Buhler Allied Y9620 96" 3 pt. two-stage snowblower, John Deere cylinder with hoses, new updated 540 PTO shaft with shear pins, quick hitch-style 3 pt. mast, pin-adjust skid shoes, good original cutting edge. Serviced through shop.